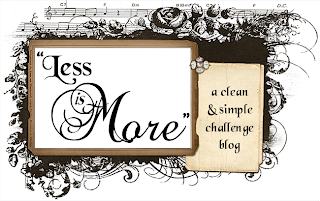 June is one of our 5 week months, which means a special one for "Less is More"
and we are delighted to have Kim join us as our Guest Designer this week. Many of you will know Kim as a regular to "Less is More" admired and gathered much inspiration from her. Kim lives in Colarado, America. We are sure you wil lhave seen the horrendous fires happening in the state at the moment. We'd like to offer our thoughts for everyone's saftey at this time. header as the inspiration for this challenge. 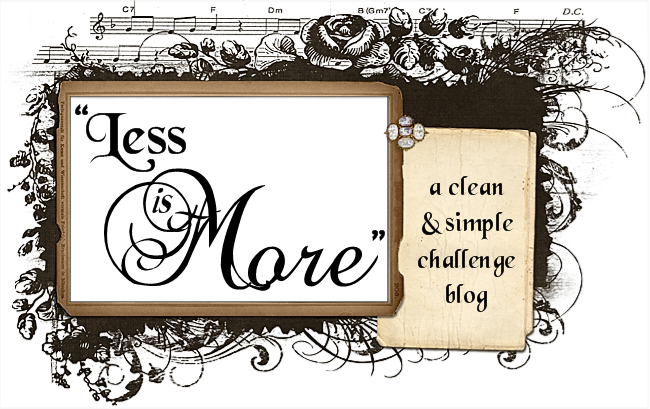 ** Our blog header has a transparent panel behind the "Less is More"
We love to see how many different ways this could be interpreted. You could simply do a CASE of it or use any of the elements as your theme... a decorated frame, the music, the flourishes, the flowers, the sentiment, the colours, the little jewels, there's really quite a lot of scope to let your imagination roam. If your link is somewhat tenuous however, we would like you to explain just what your inspiration was. This is a straight case of our header. I used some Artemio music manuscript, a Kaisercraft collage stamp for the bottom part and a flourish whose origin is a mystery to me. I spotted the Less is More stamp on a website and bought one for Mandi and myself as I couldn't resist them. 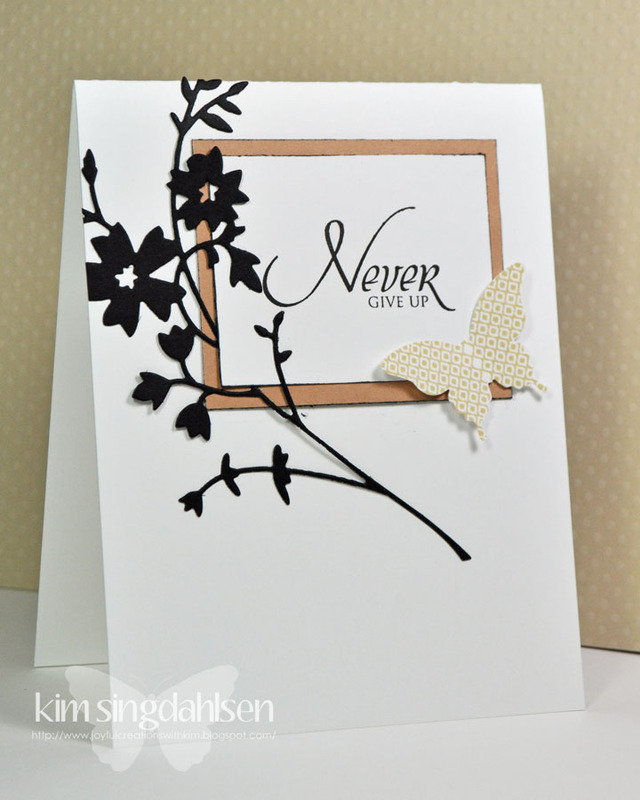 I began by stamping the sentiment and then popped a mask over it to add the other stamps. For this one I took my inspiration from the music and the flourishes, plus the general colours. Once more it's the Artemio music stamp and some Indigo Blu flourishes (they are rather difficult to spot beneath the SU butterfly). The other stamps are from Blockhead. The inks are SU Sahara Sand, Crumb Cake and Soft Suede applied with Ink Duster Brushes over a Post It mask across the bottom of the card. The sentiment is from Hero Arts. My Keep Calm sentiment was computer generated. Keep Calm sentiments are everywhere over in the UK. I mounted it with 3d foam onto a square of brown card. The flourish, I have used all this week by Cheery Lynn. Roses, gem embellishment and punched leaves to finish. This is a difficult one, I really have to think/feel this through. WTG Girls another fun challenge! Great samples for sure! OMG, just found your sight and love what you girls have done this week. I definitely will be watching and participating in your challenges. Great work ladies. Well, I found it was quite a challenging theme, this week, but everyone is doing a great job! This was hard!! Thanks for making me think! 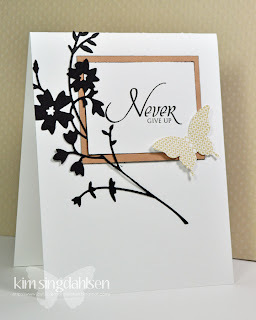 Lovely idea for the challenge thak you and some beautiful cards. First, thanks for featuring my card with the clock sticker on the last challenge and second, have always loved your header so it wasn't too much of a stretch to create something from that inspiration. This has got to be your most brilliant challenge ever!!! Thanks so much for the chance to play alsong. And your cards are absolutely fabulous girls@! !